These manual lift table not only will save back injuries but increase productivity. Lift the work items either from the floor up to the work shelf or in the warehouse lift the heavy item off the shelf onto the floor for shipping. 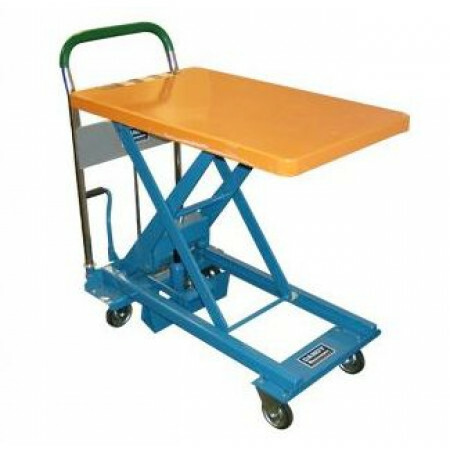 Four casters 2 fixed and 2 swivel for easy maneuvering around the mail center, office or warehouse. Large pump peddle for lifting the mailbags and totes up to a work ares for processing and sorting. Foot activated parking break and Large grip lowering handle. Three models with different load capacities and table sizes. Model L330 Capacity 330 lbs - Table Size 17.7" x 28" - Raised Height 29"
Model L550 Capacity 550 lbs - Table Size 19.7" x 31.5" - Raised Height 31.8"
Model L110 Capacity 1,100 lbs - Table Size 23.6" x 35.8" - Raised Height 36.6"